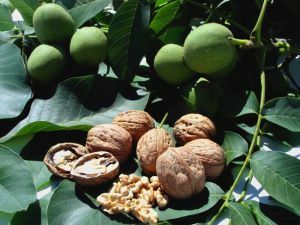 Chandler walnuts are oval; their base and top are rounded; their sting pistil shape is little developed. Valves are sealed and the suture edge between them is thin and little pronounced. Their shells are weak, fragile. The fruit has usually a good size, with a diameter greater than 30 mm; its medium height is 38-40 mm, average diameter 32-34 mm, weight between 9 and 13 g.
The kernel is light in colour for 90% of the fruits and rather fleshy.